Star Wars: Legion is a game of strategic positioning. If you are able to navigate the battle field effectively and force your opponent to engage on your terms, you are going to have a better chance of doing well. Part of being able to outmaneuver your opponent is knowing the ranges of weapons and the speed of units, how that translates into board space, and how to use that to optimally deploy your units against your opponent. In a competitive game you and your opponent both bring a deck of 12 mission parameters (4x of each: Objectives, Conditions, and Deployment) and will play a mini game to determine which mission is being played (often referred to as turn 0). The player who's list is the lowest points gets to chose if they are the red player or the blue player, and then the blue players scenario deck is used. Because there are more than 4 of each parameter there are some strategies when choosing which to include in your deck, and also when choosing which to keep and which to eliminate during the mini game to determine the actual mission played. Keep in mind that your individual play style and list composition will determine which mission parameters will favor you most. Players deploy opposite each other along and within range 1 of the long table. This deployment is generally considered the standard. It allows forces to spread out over a wide distance allowing you to pick favorable matchups between units - giving the red player a slight advantage as they can counter deploy the appropriate units to the units blue player deploys first. In scenarios where you place objectives it gives you a lot of options for locations. armies deployment lines are at range 4 from each other meaning that if both units are at the edge of their deployments then an average trooper unit with speed 2 and range 1-3 deployed across from their target will be able to shoot turn one. if a unit has speed 2 and a range 4 weapon it means that it is not possible to deploy far enough back to avoid being shot on turn one. a pair of 1.4 FD Laser canons deployed at the edge of their deployment lines at an equidistant range 4 from the table edges and each other will be able to cover almost all of the table and target most units as soon as they leave the opponents deployment zone. Because of the short distance between starting armies this deployment is a great choice for lists with short to average range weapons. Because it also generally allows for firing on the enemy first turn this deployment will give a slight advantage to lists that bring more units - allowing you to get an early lead on damaging the enemy before they have a chance to unpack their units into the locations they want to be. If your list contains long range weapons then this deployment removes a lot of your starting advantage. Players deploy opposite each other along and within range 3 of the short table. The Long March is the second most basic deployment and in many ways is the inverse of Battle Lines: It limits the area that you can place objectives and narrows the movement options of units making it harder to out avoid specific units, it also increases the distance between armies making it not possible for average units to engage with each other on turn one. armies deployment lines are at range 6 from each other meaning average units can't advance and shoot on turn one. 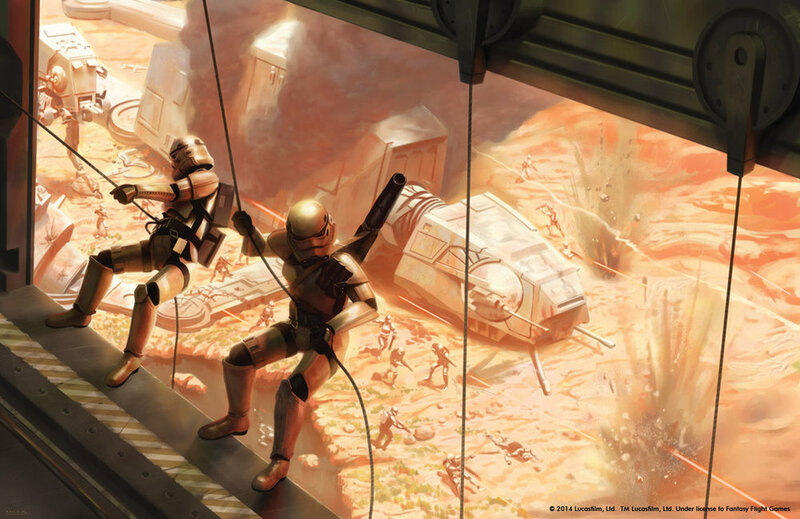 Speeder Bikes can double move and shoot units that have left their deployment zone on turn one, however be careful to not get them too far ahead of your main force or they will die due to being the only viable target. an average range 1-3 unit deployed in the center of the board can threaten the width of the field with their attack making it hard to avoid or move past units in this deployment. In the Intercept the Transmissions objective each player will have one objective starting on their deployment line. The Long March is a great option for lists that have long range weapons (4+) because you will be able to shoot your opponent before they are able to shoot you giving you a significant advantage in attrition. Because a single unit in the center line can cover the entire width of the board, this deployment is also a good choice for armies with low model count as you can make it difficult for your opponent to avoid your units - ensuring that all your units are contributing to the fight. If your opponents list contains longer range weapons than you or you have a particularly slow list then this deployment should be avoided. players deploy in opposite corners with half of Long March and half of Battle Lines deployments overlapping creating the shape as seen above. Major Offensive is a hybrid between Long March and Battle Lines making it a great option to push for if the other available deployments are unfavorable to you. You can deploy your units at the edges of the deployment to get shots on turn one, or you can deploy further back into your zone if you have longer range weapons to ensure you get the first strike. This deployment also has lots of room for placing objectives and for maneuvering faster units. There is nothing of particular note on Major Offensive because it lends itself well to all list styles and can be played in many different ways. Major Offensive is very balanced and fits most lists and play styles. This deployment is rarely a bad choice. Players have two deployment zones in opposite corners, each zone is range 4 by range 1 as shown above and each zone must have at least one unit in it. In Disarray you begin at Range 4 from both of your opponents deployment zones meaning that you can generally begin attacking on turn one. This deployment also has a lot of space you can place mission objectives, and often further from an enemies main forces because of the split deployment. each deployment zone must have at least one unit in it, so single commander lists will have a hard time controlling all their units. all zones are within Range 4 of each other meaning you can attack either zone round one. if the opponent deploys trooper units in a zone without a commander it is easy to panic them off the board turn one for a significant attrition lead. Lists that have two commanders do particularly well in this scenario, as do lists that include a lot of vehicles because they can be deployed away from their commander without fear of panic. If you only have a single commander and no vehicles to deploy in the second zone then this can be a hard deployment. Players deploy in overlapping Range 6 by Range 1 zones as shown above. Immediately after you deploy each unit it can make a Speed 1 move, even if it would normally be stationary otherwise. Advanced Positions can start units quite far apart and thus tends to favor lists with longer range. However because you get a free move after deploying you can get behind cover before the opponent has a chance to shoot at you. This deployment is great for objectives that require tokens at a distance from the deployment zone, particularly Recover the Supplies and Sabotage the Moisture Vaporators, because you can use your move at deployment to move up to the objectives. because lists can start so far apart (as far as Range 10) units with long range weapons or great speed are beneficial. Scouts and Commandos who natively have Scout 1 become Scout 2 making a speed 2 move at deployment which can allow them to reach objectives or begin making shots at the enemy on turn one. Advanced Positions is a versatile deployment and can be made to favor multiple play styles, but generally is best for lists that want to keep their distance from the enemy or want to grab an objective and then play keep away. If your list consists of short or average ranged weapons or slow moving units this can be a difficult deployment.